The colonies overwintering in the WDBKA apiary have been treated with Api-Bioxal. It was straightforward to follow the directions to mix the crystals with sugar solution and apply 5mls to each seam of bees. At this time of year it is good to be able to have a quick peep under the crown boards and check that all is well. Some of the lighter colonies were given fondant but some were still very heavy. 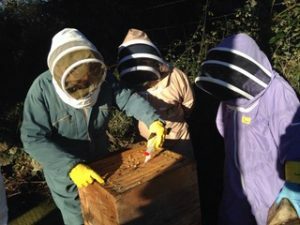 Thank you to everyone who came to help … hopefully the treatments will help the colonies to keep their Varroa levels down.